[I took the Delicious Dublin tour in 2016, wrote this post after, but forgot to publish. I was lucky to win two tickets through an Instagram competition! It's a half-day food and drink tour of Dublin city centre hosted by Ketty aka French Foodie in Dublin. Ketty has been blogging about Dublin's food since 2012 and is a fellow Ballymaloe alumni. Her warmth and passion for Irish produce and Dublin's food businesses shines through on the tour. I loved hearing the stories from the business owners themselves of how they started, surviving and thriving through the recession, and the stories behind their most popular dishes. As a born and bred Dubliner, I got as much out of the tour as the visitors who were with us. It's a chance to get behind the scenes access to some of our hidden gems. We met the tour group on a Saturday morning at the GPO. 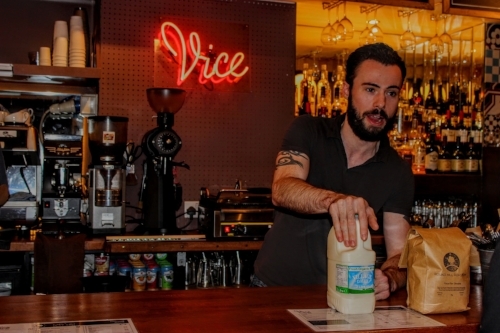 After introductions, our first stop was for coffee around the corner at Vice Coffee on Middle Abbey Street. A popular dish, Eggs Menemen, a Turkish dish of soft scrambled eggs with whipped feta yogurt, mixed roast peppers and a mix of chili & red onion on top. Kieran at Murphy's Ice Cream on Wicklow Street, making ice-cream in Dingle since 2010. They use local farm milk, cream, free range eggs and organic sugar, even making their own sea salt from Dingle sea water! We stopped here for a cone, I went for the cookies flavour, using homemade cookies. At the seafood restaurant Super Miss Sue we had fresh cod with crushed peas and tartare sauce from their chipper, Cervi. Perfect fish and chips, fresh fish, a light batter, tangy tartare and homemade chips. From their website: "Cervi was named after In the 1880's, Giuseppe Cervi accidentally got off the boat in Cobh, County Cork thinking he had arrived in America. He walked the long journey to Dublin and, after working several odd-jobs, began selling fried fish and potatoes outside of city centre pubs after closing hours. He and his wife opened the first ever fish and chip shop on Pearse Street. Giuseppe's wife, with her limited english, offered customers "Uno di questa e uno di quella" - One of this (fish) and one of that (chips). This ultimately remains in inner city Dublin vernacular for ordering fish and chips as a "one and one"." Tasting Irish cheeses at Sheridan's Cheesemongers, South Anne Street. We finished up with a whiskey tasting with the lovely staff in The Celtic Whiskey Shop on Dawson Street. We were aglow with food and drink heading off into the afternoon.